Sweden is home to some incredible wildlife. While most people may think of Reindeer and Elk, the Scandinavian peninsular is full of charismatic and incredible animals that can only be found outside the bigger cities. While our ancestors did a pretty decent job killing a lot of the animals that used to populate Scandinavia, many of the large mammals are now returning in good numbers not only across Scandinavia but also throughout the rest of continental Europe. 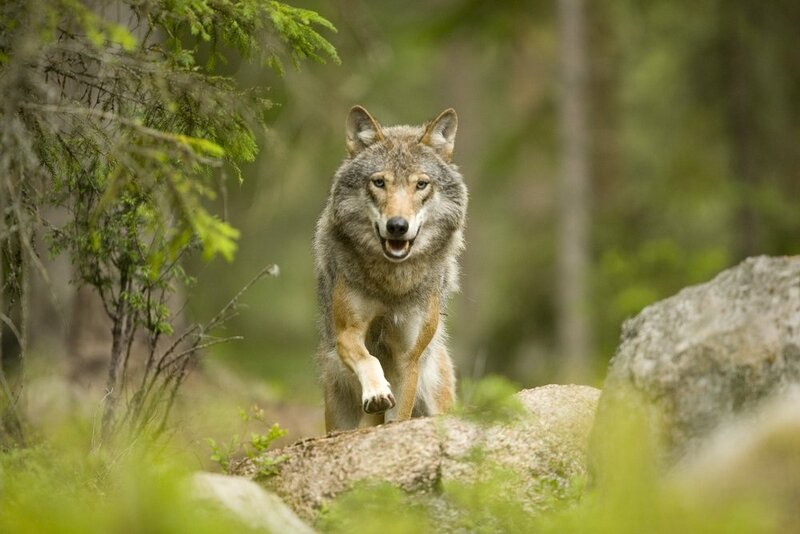 Sweden is home to spectacular species such as Brown Bears, Lynx, Wolves and Wolverines. Here are some of the Sweden’s most incredible wildlife. Arctic Fox is endangered and barely manages to survive in small fragmented populations in the Scandinavian mountains. With a warmer climate the larger Red Fox is taking over the habitat of the Arctic Fox. Feeding stations are set up and Red Foxes are hunted to increase the chance for Arctic Foxes to survive. The Scandinavian Wolf population was hunted to extinction but in the 1980’s several Wolves have migrated naturally from the Finish-Russian population. Despite poaching and licensed hunting the Wolf population has increased to several hundred Wolves since then. Since Wolves are practically banned from Northern Sweden because of Reindeer herding, the Wolf population is concentrated to Central-Southern parts of Sweden. The best chance to experience Wolves in Sweden is to join an experienced tracker for some days of tracking. Lynx are rare and shy but can actually be found all over Sweden. The population is threatened by poaching and licensed hunting. Because of their shy behavior it is very difficult to see Lynx in the wild. 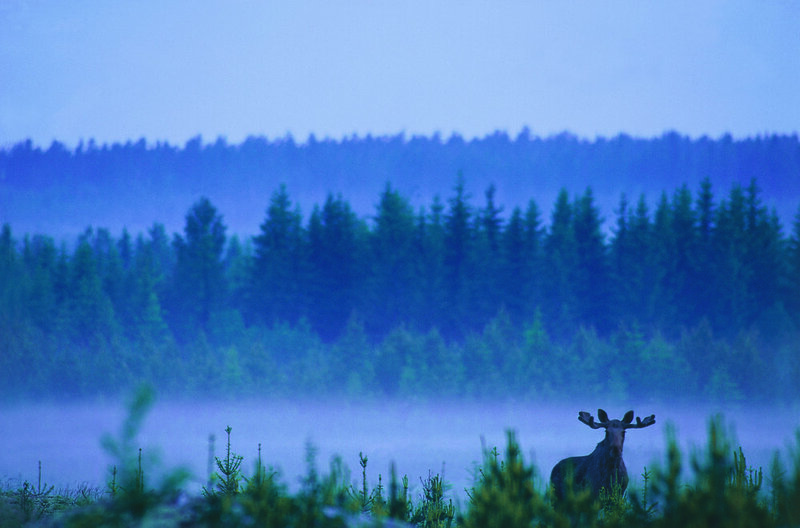 Moose or European Elk can be found all over Sweden. In fact, there are more Moose per square kilometer living in Sweden than any other country in the world. Although the population has descreased drastically since the 1980’s because of hunting there are about 400,000 Moose in Sweden during the summer months. A good place to see Moose in the wild is in the forests of Central Sweden. During the winter you can view Moose that gather in valleys in Lapland. The largest Moose in Europe are found in Sarek National Park in Laponia World heritage in Swedish Lapland. White Moose are not albinos. They are rare genetic variants of the Moose (Eurasian Elk), with white fur. They carry a genetic mutation that gives them white coats. It’s the same genetic mutation that gives humans red hair. A brown cow can have a white calf and vise versa. Only about one hundred of the white Moose are known to exist. These white Moose are found almost exclusively in the boreal forests of Värmland, in the borderlands between Sweden and Norway. Known as Rudolph, Santa Claus’ best friends, Reindeer can be found in Lapland and in large parts of the Northern half of Sweden. Although they roam free they are all semi-domesticated which means they all belong to some owner, usually a Sami. Samis are the indigenous people of Northern parts of Scandinavia and Russia. Reindeer herding is still central to Sami culture and crucial to the subsistence of the Sami, providing meat, fur and transportation. Reindeer herding is threatened by a change to modern lifestyle in combination with the comeback of the large carnivores like Wolves, Lynx and Wolverines, as well as by exploitation of natural resources. Brown Bears can be found in large parts of Sweden, especially in the regions of Hälsingland, Härjedalen, Jämtland and Dalarna. Are Brown Bears dangerous? No, most Bears are very shy and stay away from people. Unlike in America you don’t have to put your food up in the trees while camping out. Bear encounters are extremely rare. 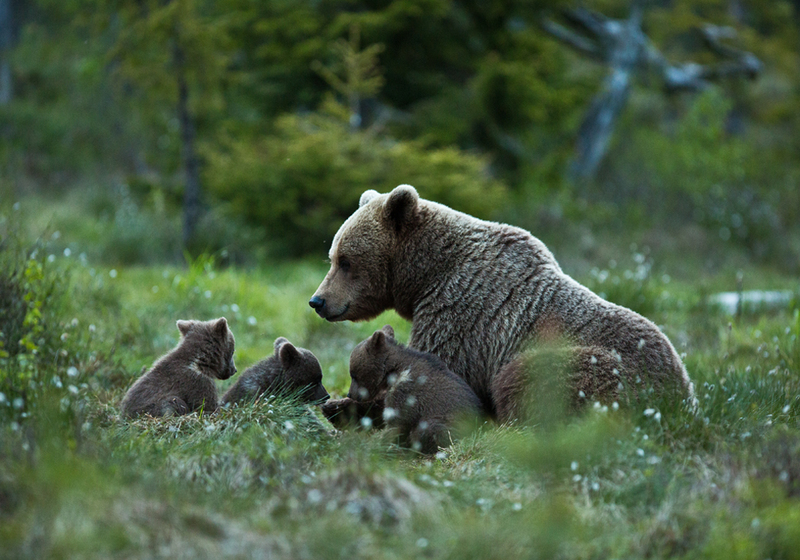 The most successful way to watch Brown Bears in the wild is from a safe hide with an experienced guide. The Great Grey Owl is perhaps the most characteristic bird in Sweden. Although they are often referred to as Lapland owls they can also be found in many parts of Central and Southern Sweden. Great Grey Owl is threatened by the forest industry that cuts down the old growth forests which results in fewer nesting trees. Found in the Swedish woodlands Capercaillies are the biggest species of grouse in the world. Capercaillies can still be found in large parts of Sweden although their numbers have decreased drastically. Their biggest threat is the forest industry that harvest old growth pine forests, the Capercaillie’s natural habitat. The Capercaillie lek is one of nature’s most spectacular mating displays. The female Black Grouse is perhaps best known to pose at the whiskey label The Famous Grouse. 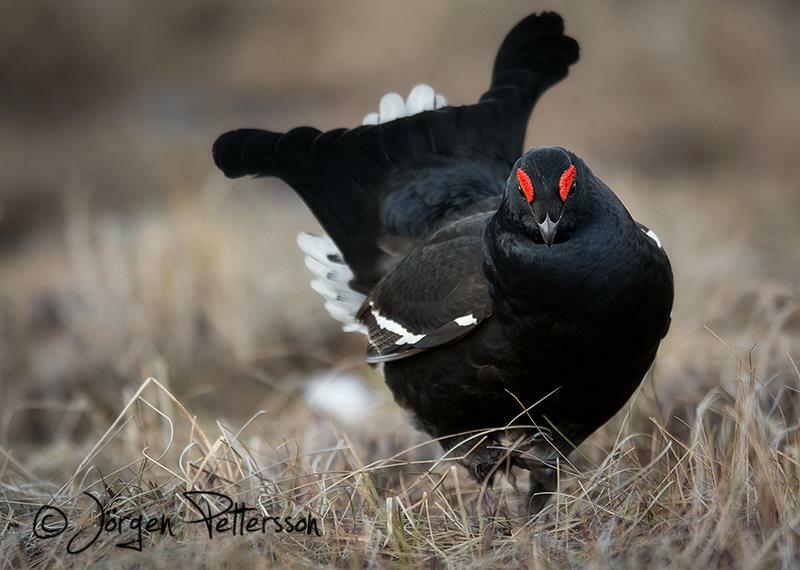 Black Grouse can be found in forests all across Sweden. In Spring each year, Black Grouse gather on bogs and wetlands in the early mornings to perform their peculiar courtship ceremony, the Black Grouse lek. Beavers are Sweden’s largest rodents. During the 1800’s They were hunted to extinction mainly for their gall bladder that contains the important acetylsalicylic acid, natural aspirin which is used as a head ache medicine. Some eighty Beavers were later introduced from Norway to Sweden and their population is now estimated to more than 150,000 individuals. If you really want to see a Beaver then Bergslagen and Dalarna is a good place to start. Bonus #12) Red Squirrel – one of our favorite animals! Red Squirrels are common throughout Sweden. They are often seen at bird feeding stations in Winter. Sometimes they may even come up to you to see if you are ready to share your packed lunch. The invasive species Grey Squirrel that originates from Northern America is unfortunately displacing the Red Squirrel. This is happening in both Britain and continental Europe, but not in Scandinavia.